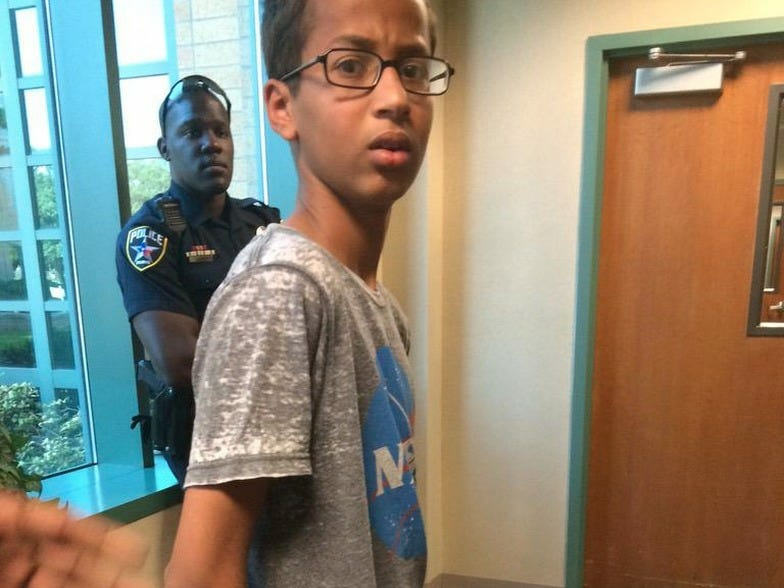 Mark Zuckerberg publicly defended Ahmed Mohamed, the 14-year-old Muslim student who was arrested after bringing a homemade clock to school. The clock that prompted the school's call to the police consisted of a circuit board and a power supply wired to a digital display inside a metal pencil case, according to the Dallas Morning News, which first reported the freshman's arrest. The police decided not to press charges against the high-school student who had been proud to show off his engineering achievement to his teachers. Meanwhile, Mohamed's family is adjusting to his overnight popularity following the harrowing arrest, according to the Dallas Morning News. His older sisters set up a Twitter account for Mohamed, and the family may have a couple places to visit if he decides to take Zuckerberg or Obama up on their offers.